When The Last Man on Earth premiered on Fox in March of 2015, I checked it out based on the fact that I like Will Forte and Executive Producers Phil Lord and Christopher Miller have a good track record with their movies. What I found in the show was a unique take on the familiar theme which we've seen in movies like Omega Man and I Am Legend. The show mixed these ideas with a quirky sense of humor. While the show ran out of steam early in its second season, I still respected the original voice which I found in the show. Or at least that's what I thought until I saw 1985's The Quiet Earth. Why the makers of this film haven't sued the pants off of Forte, Lord, and Miller, I will never know. Zac Hobson awakens in motel room, annoyed that he did not receive his wake-up call. He dresses and heads out to work, but it doesn't take Zac long to realize that the streets and sidewalks are empty. He makes his way to the lab where he works, and discovers evidence that something called "Project Flashlight" has been carried out. Zac leaves the lab and explores more of the city, finding that he is utterly alone. Thus begins a cycle of indulging in this newfound freedom and then succumbing to the loneliness which comes along with it. Will Zac every find another person and will he discover why everyone has disappeared? I frequently haunted video stores in the 80s, and I can clearly remember seeing The Quiet Earth on the shelf. I can't remember what it was exactly about the VHS box which sent this message, but for some reason, I assumed that the movie was some sort of ecological message movie. So, my first impression of the movie was that I was surprised that it is a straight-ahead science fiction film. Of course, the second thing which struck me, as noted above, was how similar the story was to that found on The Last Man on Earth. There needs to be a word for when you spot a rip-off, but in reverse order. Moving those initial surprises, The Quiet Earth clearly wants to update the ideas seen in the movies which were based on Richard Matheson's I Am Legend. This film is also based on a novel by an author named Craig Harrison, takes the notion of being totally alone and gives it some modern twists. While the character in I Am Legend is running from vampire-like creatures, Zac is trying to avoid boredom and depression, as well as a sense of guilt, as he suspects that he was part of the experiment which caused this disaster. We watch him go through several stages -- confusion, fun, and then desperation. The first act of The Quiet Earth is definitely the best part of the film, as it's the most relatable. When Zac moves into a mansion and begins to indulge himself, we completely understand that. Likewise, when the reality that he is all alone truly hits Zac, we understand his reaction. At the mid-point, the movie reaches a fork in the road. On the one hand, Zac could have been the sole character for the entire film. This may have been limiting, but it would have been somewhat different. On the other hand, the movie could have introduced another survivor so that Zac could have someone to live with. This should not be a spoiler, but Zac does discover another survivor. And this is where the movie loses steam. Zac and Joanne (Alison Routledge) are supposed to be somewhat awkward together, as they are facing the fact that they are alone and must get along simply to have some socialization. However, the scenes with the pair don't work very well, and don't feel very genuine. Part of it is the actors, but it also has to do with the writing. They meet and then don't do much. They do some exploring, but the movie really slows down. Things pick back up in the third act, as another emotional level is introduced, but things feel cliched. The ending is somewhat interesting, but it is admittedly convoluted. So, after all these years, I'm glad that I finally saw The Quiet Earth. While I don't agree with the blurb on the box which claims that it's "the best science fiction film of the 80s" (I think that works of James Cameron would disagree with that), but it's a fairly solid movie. And while I may have overlooked it in the video store, it's clear that others saw the movie, as it was obviously influential. Therefore, it's nice to see this re-release so that a new generation (and me) can discover it. 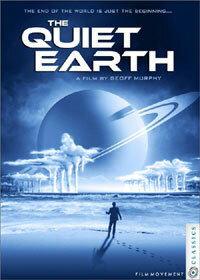 The Quiet Earth stars a Steve Railsback look-a-like on Blu-ray Disc courtesy of Film Movement Classics. The film has been letterboxed at 1.85:1 and the Disc contains an AVC 1080p HD transfer which runs at an average of 35 Mbps. The image is very sharp and clear, showing no distracting grain and no defects from the source materials. The transfer looks fantastic for its age. The colors look very good and the image is never overly dark or bright. The picture has a notable crispness to it, which lends a great amount of depth. The image is rarely soft and shows good detail. The Disc carries a DTS-HD Master Audio 5.1 track which runs at 48 kHz and an average of 4.0 Mbps. The track provides clear dialogue and sound effects. The track offers intermittent surround sound effects, but when they do appear, they are effective. We get some nice stereo and surround when Zac is exploring the deserted streets. A few moments serve up mild subwoofer effects. The Quiet Earth Blu-ray Disc is rather short on extra features. We begin with an AUDIO COMMENTARY from astro-physicist Neil deGrasse Tyson and RogerEbert.com critic Odie Henderson. The only other extra, aside from the liner notes, is a TRAILER for the film.